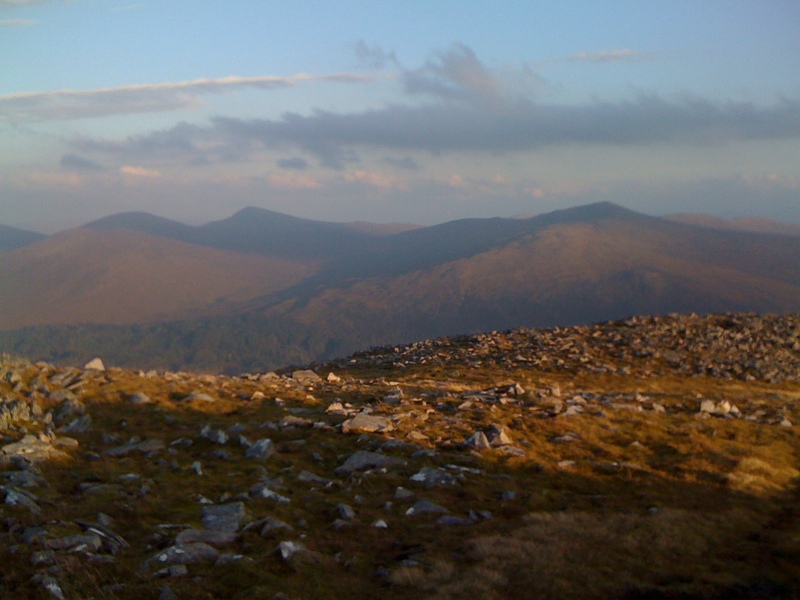 I have been back across west for the last few days working with the 1st year students from West Highland College. The aim was for a 3 day back packing journey to look at camp craft, the environment, navigation and some emergency procedures. I love these trips for the college as there is no set location for the 3 days so I can go and explore a new area, and if I am lucky tick off some new Munro's. So after a quick chat with the students on Wednesday morning about equipment and our aims we had a look at areas on the map and found that none of us had been to the Munro's to the east of Loch Treig. We parked at Fersit and headed along the track to the Strathossian House area were we set up camp next to the river and then headed up Beinn na Lap to see the sun setting. It was a great night as is shown by the photos above, it was then back to the tents for a good nights sleep. On Thursday we headed west up to Meall Dhearcaig and alone to Chno Dearg and then onto Stob Coire Sgriodain, this area was great for navigation as we were in thick cloud and rain from about 600m! We then headed south to a camp fairly low down and after a bite to eat headed out for 2 hours night nav. Finally today we spent the morning in and around camp talking about equipment, the mountain leader award, emergency procedures and river crossings before heading back to the college. It has been a busy few days for me. Last Wednesday and Thursday I was across in a wet Fort William working for West Highland College. Wednesday was a day with the 2nd years looking at some navigation and personal hill skills as they get ready for an assessment in November. My group and I spent the day in some heavy rain in the Torcastle area looking at micro nav skills. On Thursday I was out with a group of 1st years again looking at navigation and having a general warm up before an expedition this coming week, it was again wet!! I then drove down to Alyth in Perthshire to meet up with a Gold Duke of Edinburgh group from St Aloysius College from Glasgow. We spent 4 days doing a loop from Alyth as they prepare for their Gold Assessment in Iceland, we looked at the the usual Duke of Edinburgh things like navigation, campcarft, teamwork, emergency procedures. Thankfully the weather was much nicer as can be seen in the photo above. Home for a day now before heading back across for 3 days with the West Highland College 1st years on a back packing trip and then a weekend at Glenmore Lodge. Looks like the weather is on the up for the end of September which will be nice. Catch Up - But no Photos! I have been a bit slow to update the blog over the last week or so due to being busy and still not having a working camera, sorry! Since climbing Castle Ridge with Mike I have met up with Wyn who was up from Wales on holiday and looking to progress his scrambling skills. We sent the first day on a very wet Zig Zag's in Glen Coe sheltering from the wind. During our ascent and descent we looked at rope work, placing gear, abseiling and other little tricks. Wyn then had a day off and I spent the day working for West Highland College running some Mountain Bike sessions on their induction week, it was great to meet all the new students and we had a lovely dry day! Meeting up with Wyn the next day it was again windy and wet so we headed east to try and escape the worst of the wet. We headed to the Cairngorms and up through the twin ribs area and along Ficaill Ridge taking in all the hardest bits, with Wyn doing his fair share of the leading putting in to practice what we had covered 2 days before. 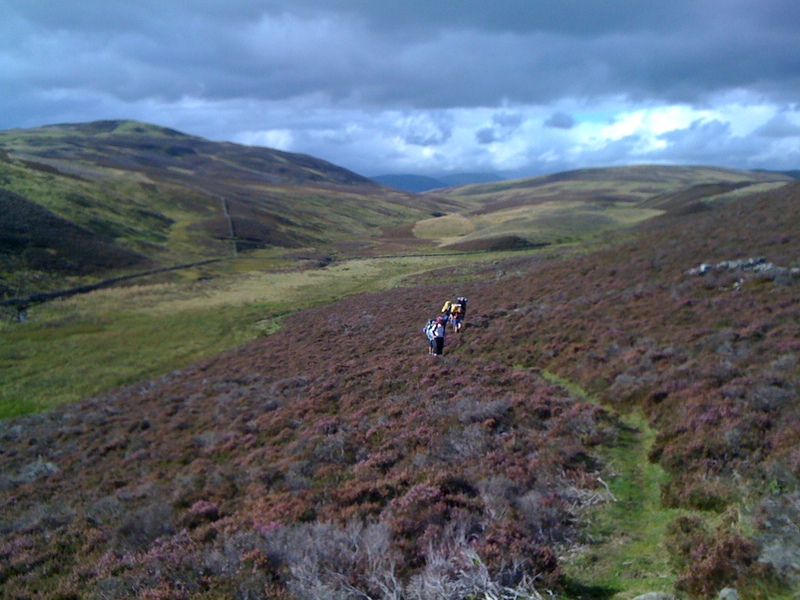 After a few days off and a spot of Mountain Biking around Strathpefer it was back across to the west in what must have been some of the wettest weather so far this summer to work on a Summer Mountain Leader Training with Bill Strachan. Although the weather was truly awful the team did really well to keep focused and learn lots. Next stop was a days biking with Jules Fincham around the Aviemore area, looking at some skills and riding top tips for the MBL Award, another glorious day in the sun. Strange how the good weather seems to fall on my biking days, one of the reasons I started biking was it was a good wet weather option!! It was then onto Glenmore Lodge to run a Crevasse Rescue course for a group who are heading out to Austria in a few weeks for some glacier trecking. Now back home for a few days with Laura and time to start updating the website ready for winter. Winter dates and courses will be released soon! Of back to Fort William tomorrow for 2 days with the College and then down to Perthshire to work on a Gold D of E, who said September was quiet!! 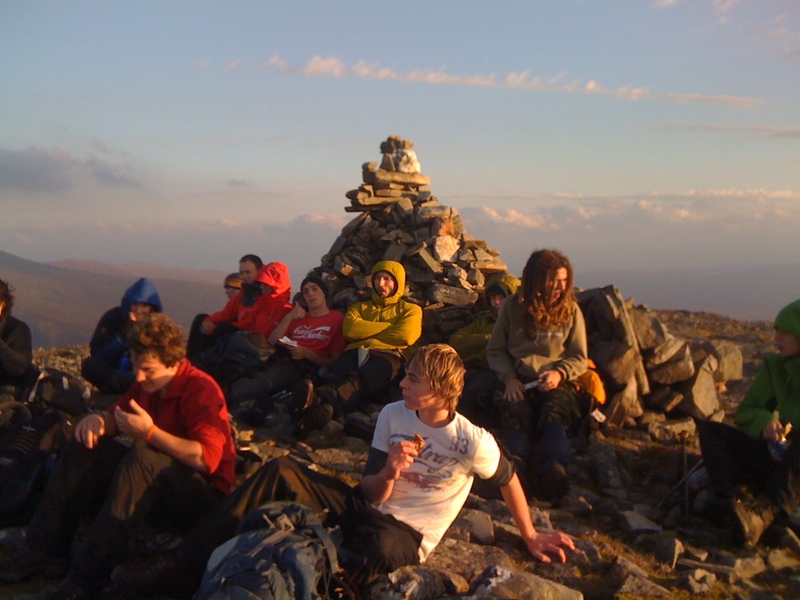 New date for a Summer Mountain Leader Training course. 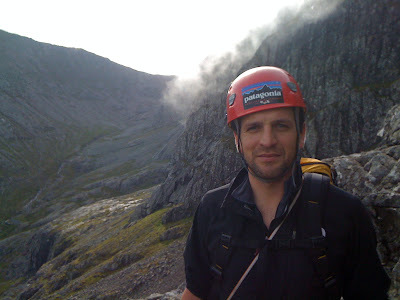 I will be running a Summer ML Training with Bill Strachan on 16th - 21st October 2011, based in Fort William. The course is being run out of West Highland College but is open to all as long as they have registered with MLTB. Mike and I headed over to the West Coast for the weekend just gone. With a wet morning on Saturday we did not leave to early with the hope that the worst of the rain would have passed when we got there, not the case! Biking was the order of the day on Saturday so we headed for 10 Under The Ben at Nevis Range, I had done the World Champs course there a while back which was really good so I had high hopes for this. Unfortunately it was not so good, well rubbish really, it is graded red but 90% if on forest track and non technical single track with a few hundred meters of good downhill and a section of black that does not fit in with the rest of the course at all. It had rained solidly and so after a quick coffee we sent sometime at the little skills area before heading for a warm shower! Thankfully the weather on Sunday was better and we headed up Castle Ridge on Ben Nevis, this was great and on the whole dry with the ridge coming in and out of the cloud. There are no route finding difficulties as you just follow the crampon scratches from winter and the clean rock. We then came down via ledge route and back to the car. 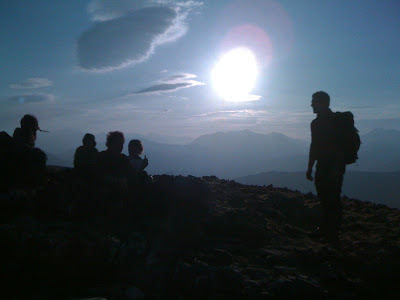 A great dry day out and another the classic Ben Nevis ridges done. Just the one photo this time as my camera is broken so am using my phone! I have taken the last 2 weeks off to settle into our new house and help Laura with the start of a new job, running a boarding house for 75 teenage girls is a full on job! I have though managed to get a few days cragging in with Monty, a very busy day at Cummingston with all sorts of groups there and a very quiet day at Redhythe with no one there! I am across west this weekend for a little more play with Mike before it is back to work next week.